Qantas Airways Limited is the flag carrier of Australia. The name was originally "QANTAS", an acronym for "Queensland and Northern Territory Aerial Services". Nicknamed "The Flying Kangaroo", the airline is based in Sydney, New South Wales, with its main hub at Sydney Airport. It is Australia's largest airline, the oldest continuously operated airline in the world and the second oldest in the world overall. 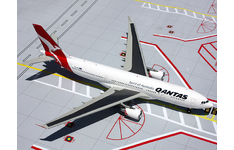 Collectable Aircraft Wings Australia allows you to buy Qantas Models online. Product Description: Airline: Qantas Airways Aircraft Type: Airbus A330-200 R.. Product Description: Airline: Qantas Airways Aircraft Type: Airbus A330-300 R..
Qantas Australia Lockheed L-188C Electra and L-1049G-82-53 Super Constellation in '1950s' colours, b.. Product Description: Airline: Qantas Airways Aircraft Type: Boeing B737-800w .. Product Description: Airline: Qantas Airways Aircraft Type: Boeing B747-400 R..